Sometimes a great band’s timing is so off that they make a masterpiece that totally slips under the radar. 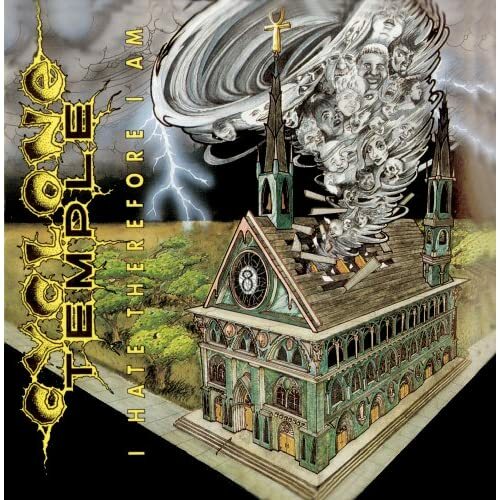 Cyclone Temple’s debut ‘I Hate Therefore I Am’ is one of such cases. After releasing some cool Thrash albums – ‘Act Of God’ mainly – with Znöwhite, guitarist Greg Fulton decided to start up a new band with the final Znöwhite lineup and as a result recorded one of the finest Thrash records of all time. Sadly, nobody cared about Thrash Metal anymore in 1991 and what should have been Cyclone Temple’s road to glory turned out to be a bumpy one ending in an abyss. Looking back however, it’s remarkable that all the people who were waiting for Metallica’s self-titled at the time didn’t pick up this one, as it definitely wasn’t miles away from what Metallica was aiming for on ‘Master Of Puppets’ and ‘And Justice For All’. ‘I Hate Therefore I Am’ displays an open minded Thrash sound with Fulton churning out riffs that are capable of making James Hetfield blush and song structures that many Thrash greats can only dream of. Calling this progressive Thrash would be a step too far, but opening the album with the long build-up that the largely midtempo ‘Why’ has is a daring move and the two masterfully structured semiballads that are ‘Words Are Just Words’ and the title tracks are right up there in the ‘Fade To Black’-category of class. In fact, it isn’t until the fourth song (‘Public Enemy’) that there’s something of full-on Thrash on this album. That doesn’t mean there isn’t anything to enjoy before that. The aforementioned ‘Why’ is an intriguing exhibition of teenage angst fittingly vocalized by the raw-edged melodic vocals of Brian Troch and ‘Sister’ is a heartfelt cry that marries Thrash riffing with an almost bluesy vocal delivery. What follows takes Thrash as far as it possibly could have been taken at the time. One song I’d like to specifically mention here is ‘Born To Lose’, which sounded a little strange to me at first, but quickly became one of my favorites of the albums, mainly due to its amazing chorus. The choruses are remarkably strong on this album anyway, especially considering that it’s a Thrash album. As for the individual performances on this album, there are two men that are most definitely up front. First of all, Greg Fulton is an amazing guitarist. His hyperspeed palm muted riffs are as pulsating as they need to be to test your neck (just check out stuff like the intro to ‘Silence So Loud’ or the main riff to ‘Public Enemy’) and they have a precision that only Exodus’ H-Team, Slayer’s King and Hanneman and Hetfield could equal at the time. His passionate solos (‘I Hate Therefore I Am’!) are killer and serve as a perfect extension for Brian Troch’s heartfelt wails. Troch is obviously more of a Bluesrock singer than cut from the Metal mold, but he fits that within the Thrash context perfectly, creating emotional vocal lines that wouldn’t really have showed up on albums of Cyclone Temple’s peers. John Slattery’s drums and Scott Schafer’s bass seem to serve those two men as a main purpose, but fit in the whole thing perfectly. Those rolling bass drums sound so cool! So if you missed this out the first time around, Century Media re-released this chunk of brilliant melodic Thrash a couple of years ago and as far as I’m aware, it’s still available. Obligatory for the open minded Thrash fan, but fans of traditional Metal or even some Rock audiences may find this a great listen as well.